. . . [Saudi Crown Prince] Mohammed bin Salman (MBS) was the brain behind the coalition originally intended to return to power [in Yemen] the transitional regime established after the 2011 popular uprisings, a regime which can roughly be described as intended to shift power from one kleptocratic elite in Yemen to another. Regardless of this past, the situation on the third anniversary of the first air strikes on Sana’a city, is causing considerable embarrassment to the regime which MBS effectively leads. Even Trump, a firm supporter since he was given an extravagantly kitsch royal welcome in Riyadh last May, found it necessary to call on the Saudis to lift the blockade on Yemeni ports last December because of its dreadful humanitarian impact. In their meeting of 19 March, their obscene joint focus on acquiring billions of dollars from each other meant that with respect to Yemen, Trump and MBS went no further than agreeing that a political solution to the conflict is necessary. So three years into the war, let’s set a few records straight, starting with the death toll. According to the UN ‘only’ 10,000 people have been killed, a figure which has barely changed since early 2016 despite ongoing ground fighting, air strikes and the world’s worst humanitarian situation. It would be laughable if it were not so sad! Admittedly, this figure only refers to directly war-related deaths as recorded in the 45% of medical facilities which are still operational. What about the 140 men and boys killed at the Great Hall in Sana’a in October 2016, or the hundreds, probably thousands of men, women and children killed in other bombing ‘mistakes’ by the coalition air forces? By Huthi shelling? By the landmines dispersed throughout the country? Or those who have starved to death and are dying from disease? Are they not war casualties? What about… the hundreds, probably thousands of men, women and children killed in other bombing ‘mistakes’ by the coalition air forces? By Huthi shelling? One thing is clear: the blockade and economic warfare have killed many more people than direct military action. Thousands have died from disease, malnutrition and associated side-effects. Of the 8 million ‘on the verge of famine’ many thousands are certainly already dead, though we don’t have any figures, as most Yemenis are too ashamed to admit that their loved ones have died because they could not afford to buy food. So these deaths remain unpublicised. Yemen has the dubious honour of holding two world records at the moment: first that of the worst humanitarian crisis with more than 22 of its 29 million people in need of humanitarian assistance, in plain English unable to have basic acceptable living standards: 18 million are food insecure, ie hungry. Why? In what passes for ‘normal’ conditions prior to the war, the bulk of basic food staples were imported [rice, tea, sugar 100%, wheat 90%]. The blockade has dramatically reduced commercial imports which address 90% of needs. Prices of available food have risen because of the higher shipping costs [delays due to the inspection mechanism, additional delays added by further coalition constraints on docking, higher insurance fees for ships heading for Yemen], higher costs of fuel [affected by the same constraints]. The August 2016 transfer of the Central Bank from Sana’a to Aden further worsened the situation, preventing most importers from obtaining the letters of credit needed for international trade. Finally the collapse of the riyal, connected to all these factors is just one more problem. So people are faced with less food at much higher cost while their incomes have disappeared. 18 million are food insecure, ie hungry. Why? Water is essential for life, clean water is a basic human requirement, without it consequences are dire. Yemen’s second world record of the worst cholera epidemic is because cholera, a highly infectious water-borne disease, has spread throughout the country as people have been compelled to drink polluted water. Most people cannot afford either to buy ‘purified’ drinking water or to boil water whether it comes from taps, tankers, wells or springs. In the towns and cities the deterioration of the already limited sanitation structures has increased the pollution level of water. Although cholera is easily treated, the rapid spread of the epidemic is less of a surprise when one remembers the disastrous shape of medical services with more than half facilities out of action. By now 1.1 million cases of cholera have been reported and more than 2,200 people have died, while in recent weeks a diphtheria epidemic has started. All these disasters could have been avoided with a minimum of compassion from the country’s politicians. So how are Yemenis surviving? As is the case in many other countries, millions of Yemenis depend on government jobs. Throughout the country, most salaries have not been paid for 18 months, and only a few have received minimal portions of their dues. The country has 1.25 million government staff, so the number of people dependent on this income is in the region of 10 million or more than a third of the country’s population. The private sector has declined by about 50%, thus leaving further millions without any income. People might ask why, in a country where 70% of the population are rural, families are not living from their crops and livestock? Even before the war, the main income for the majority of rural families was from the casual urban jobs of male household members and agriculture was only a complement. This is due to a combination of factors, among them the shrinking size of holdings as population increased, the unpredictability of rains, the cost of irrigation water. Here again the war and the blockade have worsened the situation: higher fuel and input prices have made marketing and distribution more difficult while production dropped. The country’s GDP has declined by 47% in the last three years. In this context what is surprising is how many people are coping. Most are ‘managing’ by reducing the number of meals they eat and the quality of their food, so they gradually become weaker and more likely to succumb to illness. A few have jobs with humanitarian organisations or in the remaining foreign-funded emergency projects such as those of the Social Fund for Development and the Public Works Project. Others receive remittances from their relatives abroad, mostly in Saudi Arabia (where there are still about 2 million Yemenis despite the current campaign of expulsions of non-Saudi workers which affects thousands of Yemenis) and beyond. But many others, particularly young men, even boys, are joining the military on one side or the other, the one form of employment where salaries are actually paid. Meanwhile, most Yemenis have become destitute and desperate. The UN has operated a Humanitarian Response Plan (HRP) in Yemen for years, with increased annual requirements as the crisis worsened. In 2017 it received 72% of the requested funds and this year it is appealing for $2.96 billion. A pledging conference is to be held in early April in Geneva and the amounts pledged will give an indication of how much is likely to materialise. However, these annual jamborees are often little more than public relations exercises for states to promise much and later deliver less; in the past 5 years, average HRP funding has been 60% of requirement. HRP funding is shared between the various UN agencies (WFP, UNICEF, WHO etc.). Much of it also goes to a wide range of more or less efficient and reputable International Non-Government Organisations (INGOs) which themselves both implement projects directly and subcontract to local NGOs, taking significant overheads along the way. 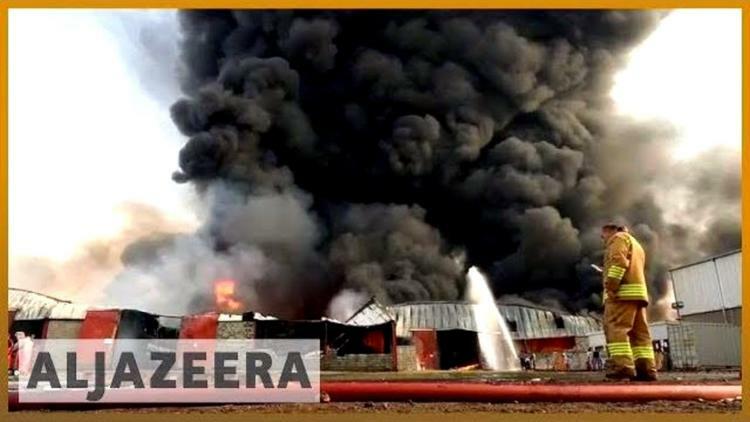 Under attack for indiscriminate bombing and killing of innocent victims in the poorest Arab country, two months after the beginning of Decisive Storm in March 2015, the Saudi regime established the King Salman Humanitarian Aid and Relief Centre which claims to address the entire world. However, in practice its main focus is Yemen: of the USD 1.044 billion spent between its establishment and end February 2018, USD 900 million was in Yemen. Despite this public relations exercise intended to improve its image, humanitarian organisations have expressed serious concerns about its complex and restrictive procedures which raise questions about its respect for the neutrality principles of humanitarian action. By this third anniversary, the US Congress, the British Parliament and European state institutions are all criticising the Saudi-led coalition, mostly focusing on the deteriorating catastrophic humanitarian situation, arms sales and technical military support to the main coalition partners, Saudi Arabia and the United Arab Emirates. In response, in January this year, the Saudi-led coalition set up the Yemen Comprehensive Humanitarian Operations (YCHO) through which it ‘commits billions of dollars in aid and support for the humanitarian response to the conflict in Yemen.’ The limited information available suggests it has two real objectives: the first is to maximise control over the UN’s HRP to which it pledged just under USD 1 billion to be paid by end of March. March 7, 2018. Saudi Arabia’s crown prince Mohammad bin Salman is greeted by Prime Minister Theresa May at 10 Downing Street on the first day of his three-day visit to the UK. Victoria Jones/ Press Association. All rights reserved.The second objective is to control delivery routes and further reduce the role of the Huthi-controlled Hodeida port where, under normal conditions, 80% of Yemen’s imports arrive and which has best access to the bulk of the country’s population. Under the excuse that Iran is smuggling weapons and other goods to the Huthis via Hodeida, the coalition has very considerably reduced the operations of the port. Having been pressured into allowing the installation of the 4 US-financed cranes, after having disabled the existing cranes through highly accurate targeting in August 2015, the Saudis had prevented their replacement. Under the excuse that Iran is smuggling weapons and other goods to the Huthis via Hodeida, the coalition has very considerably reduced the operations of the port. Most concerned decision-makers know that the smuggling routes into Yemen are along the Arabian Sea coast, as Hodeida port is controlled first by the UN Verification Mechanism and second by direct coalition interdictions. The YCHO is proposing alternative routes for Yemeni imports, all of them far from both Huthi control and the areas of high population density and need. Are they intentionally worsening the suffering of millions of Yemenis? Three years of war: what has been achieved? Three years after the Yemen crisis became internationalised, where are we? Three UN attempts to reach a negotiated settlement have failed, the most recent as long ago as mid-August 2016, the humanitarian crisis is a nightmare, the Huthis have exclusive control of the northern highlands, the ‘liberated’ areas are a government-free zone where a wide range of local entities impose different levels of administration, Yemen is fragmented, southern separatism is on the rise, the jihadi organisations move around to avoid attacks from UAE-supported Salafi security forces and US drone and air strikes; and this month has seen the US/UK agreeing billions of dollars of additional arms sales to Saudi Arabia. Trump’s recent senior appointments suggest an increasingly virulent anti-Iranian strategy which certainly coincides with that of the current Saudi regime. Things could hardly be worse. This month has seen the US/UK agreeing billions of dollars of additional arms sales to Saudi Arabia. However, there is a glimmer of hope. At the UN Security Council, some members are working towards a new Resolution which could enable the renewal of negotiations currently paralysed by the constraints of UNSC 2216. The new UN Special Envoy is free of the negative associations of his predecessor and has a record of success elsewhere. The European Union and some European states are showing strong commitment to finding a solution demonstrated by the high level delegation to Sana’a in the week of 19 March. Despite its failure, the US Congress attempt to end US active involvement in support of the Saudi-led coalition shows the increasing unpopularity of this war in the US. Few Yemenis will share the Huthi celebratory mood on this third anniversary, but millions are longing for an end to this senseless war. Let us hope that this time next year they will have reason to celebrate. Plenty more on these can be found in my book Yemen in Crisis: autocracy, neo-liberalism and the disintegration of a state (Saqi 2017) and earlier Open Democracy pieces. This includes people who are enrolled by force, as well as those who join simply to be able to finance some of their family’s needs. Helen Lackner has worked in all parts of Yemen since the 1970s and lived there for close to 15 years. She has written about the country’s political economy as well as social and economic issues. She works as a freelance rural development consultant in Yemen and elsewhere. Her new book Yemen in Crisis: autocracy, neo-liberalism and the disintegration of a state was published by Saqi books in October, 2017.